Place hot dogs on grill over medium heat. Cook uncovered 10 to 15 minutes, turning frequently, until hot. Stir together mayonnaise and sriracha sauce; spread about 1 tablespoon mayonnaise mixture on each toasted bun. Place hot dogs on buns. 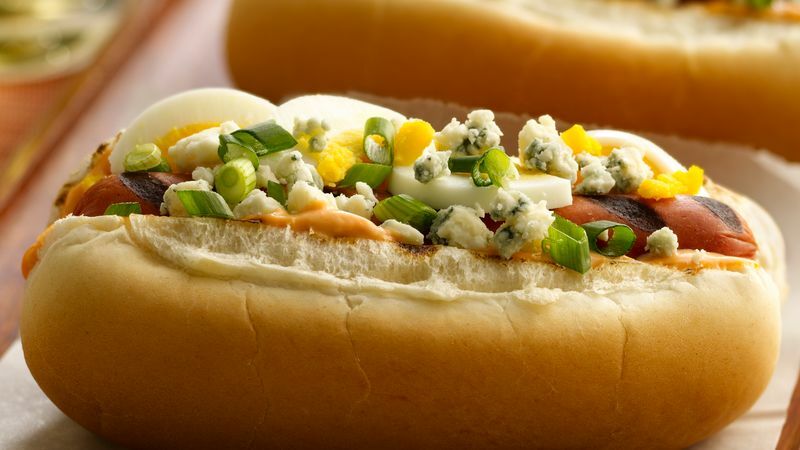 Top with eggs, blue cheese and onions. To broil hot dogs, set oven control to broil. Spray cookie sheet with cooking spray. Place hot dogs on cookie sheet. Broil with tops 4 to 6 inches from heat 4 to 5 minutes or until hot. Sriracha sauce can be found in the Asian or international aisle of the grocery store.